Approximately 90% of all the used oil filters in the United States are disposed of in landfills. This can result in roughly 17.9 million gallons of oil and 161,500 tons of steel going to waste. 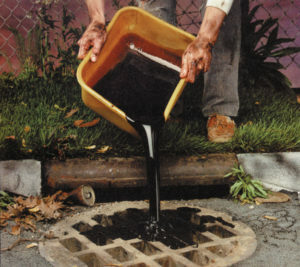 According to EPA studies, just one gallon of used oil can render one million gallons of water undrinkable. When used oil filters are disposed of, approximately 44% of the oil remains in the filter, even if the filters are drained before being discarded. If oil filters are 100% recyclable, why do many of them end up in landfills only to leach oil into our waterways? Proper handling and disposal benefits everyone. Whenever recycling is chosen as a management method, the environment is better protected through the recovery and reuse of these important resources. It is unfortunate, but oil spills do happen. When they do, some type of absorbent material such as rags, sand, speedy dry or other absorbent products are used to clean it up. These oil-contaminated solids must be disposed of properly. 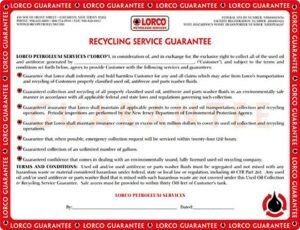 Lorco can assist you in the handling and disposal of all your petroleum-contaminated waste. This includes the removal of soil from remediation or drilling activities. It is estimated that only 12% of all waste antifreeze generated in the US each year is recycled. As a result, a large percentage of used antifreeze is disposed of improperly. Used antifreeze, which is classified as non-hazardous, should be stored in closed containers and labeled as “used antifreeze.” It should not be mixed with any other substances such as waste oil or solvents. Mixing used antifreeze with other wastes might change its classification to a hazardous waste and make it more difficult to recycle or dispose of. The used antifreeze is transported to our facility for processing and recycled into a usable commodity.